David Wilson was born in Oroville, but raised on a ranch in Biggs with 12 brothers and sisters. The family later moved to Gridley. Growing up, he developed a fondness for model cars and motorcycles. Wilson graduated from Biggs High in 1966 and was drafted in August 1967. He was sent to Vietnam in January 1968 and assigned to the 25th Infantry. Wilson was on a reconnaissance mission about 30 miles from Saigon just a month later when his unit encountered enemy forces and he was mortally wounded in the fighting. 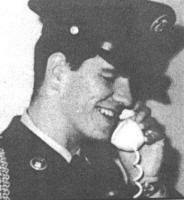 David Wilson was first reported missing, but several days later the Army confirmed he was killed in action. His letters home encouraged his family not to worry about his safety. The deeply religious young man put his faith in God.